After the Burr Lane Brentnalls …. The next two or three cottages were up a yard, and faced south. ‘Old Mrs. Brown’ was Sarah, the wife of John Rawdin Brown senior, who was the only surviving son of Thomas and Ann (nee Rawdin) and who appears to have lived most of his life in Burr Lane, where he died in March 1860. Sarah was the daughter of stocking weaver John Beardsley and Ann (nee Straw) and married John Rawdin in March 1820. Perhaps an indication of how the couple lovingly tended their Burr Lane plot was when John won the Duke of Rutland prize for the best cultivated cottage garden at the autumn Ilkeston Floral and Horticultural Society’s show in 1844. At the time of John’s death the Pioneer recalled that he was ‘for many years a distinguished florist’. Sarah died in Burr Lane in October 1865, from chronic bronchitis, aged 70. There were at least eight children from the marriage…. Adeline recalls two of them. Like her parents, the Brown’s oldest child Lydia also seemed attached to this area. When she married William Sudbury, son of lacemaker Thomas and Mary (nee Goddard) in August 1841 the couple stayed close to her parents but eventually moved up the lane and round the corner into High Street. Both Lydia and William died at 2 High Street in 1897 and 1903 respectively. Daughter Ann married Thomas Slater of South Street, shoemaker son of Thomas and Mary (nee Lowe) in February 1840. By January 1843 she was a widow with a young son – who was to die a few months later — but four years later was a wife again when she married Mapperley labourer Samuel Flint and went to live in that village. One of their daughters – Sarah Ann Flint – married Mapperley coalminer William Roe in 1868 … and later gave birth to Rawdin Roe. John Rawdin Brown junior was born in 1823 and seems to have been the argumentative maverick of the family or were they all just quarrelsome? He married Ann Bostock, daughter of miner John and Hannah (nee Straw) in October 1845, the couple already having a son — Frederick Bostock Brown alias Frederick Brown Bostock – born in November 1844. For a while they lived in the Duke Street area but were attracted back to Burr Lane in the 1860’s. In 1864 John Rawdin junior was in conflict with his widowed mother who had let a house to him at a rent of 2s 6d per week. He fell behind with the rent and Sarah took out a successful summons for him to quit the premises. At the same time John seems to have been in conflict with his younger brother Elias and had been frequently before the County Court magistrates. A few years later and he had fallen out with brothers Rawdon and Achilles. The three brothers had adjoining gardens in Burr Lane and the younger brothers had a right of way through John’s garden to access their own, a situation that often resulted in confrontations. Described as ‘nurseryman’ and ‘florist’, John Rawdin junior also died in Burr Lane, in October 1875, aged 51. A few weeks prior to his death he was lifting a heavy vase or flower pot and sustained some internal injury which never left him. His death did not stop the family squabbles – they simply passed on to the rest of his family. In January 1877 John junior’s widow Ann was in trouble with the Local Board. Ann’s Burr Lane cottage was a sanitary ‘nuisance’ as it had no privy. Three months previously the Board had ordered Ann to build one and as yet she had failed to comply. Ann was hauled before the Board but argued that she had started to build the outhouse – it would be finished in a fortnight !! This was not the last time that outhouses were a source of friction for the Burr Lane Browns. In August 1878 Ann’s son John was quarrelling with his Burr Lane neighbour, uncle Achilles. There was much shouting and riotous drunken behaviour, flying fists, violent use of a spade and pick, all resulting in a broken gate, damage to an outside closet and a fine for John. Widow Ann died in December 1895, aged 68, at the home of her daughter Ann Woodward in Cotmanhay Road. Elias, a lacemaker, married Sarah Daykin in October 1849, she being the eldest child of Bath Street lace agent John and Elizabeth (nee Turner). They moved around the town but never left it. Mary Rawdin married Isaac Fisher, joiner, in 1856, and by the mid-1860’s had moved to Alfreton. The two sons remembered by Adeline are ‘sons Chillas and Rordon (who) lived in the other (cottages). Chillas and Rordon Brown worked at Ball’s and Dunnicliffe’s Factory. Son ‘Rordon’, lacemaker, was Rawdin alias Rawdon Rawdin who lived all his life in Burr Lane, before and after his marriage to Ellen Ellis, daughter of lacemaker Elijah and Sarah (nee Bailey), in May 1857. All their 11 children except one – eldest daughter Emily — were born in the lane. In January 1884 Rawdin accompanied one of his daughters, Jane Elizabeth, to Derby County Court where he was suing his newly-acquired son-in-law, lacemaker William Richard Blake. The daughter recounted to the court a sorry tale of spousal neglect and cruelty. Jane Elizabeth was just 17 years old when she married William Richard in April 1883 but within a few months she was regretting it. Her husband soon began to abuse her physically and her fortitude was severely tested in October of that year, one evening when she was temporarily caring for her three-year old brother Harry at her rented home. A drunken William Richard returned to the house with a young fellow for company, demanded that his wife provide more ale and fetch the cards so that they could play for the drink. When Jane Elizabeth refused, the lacemaker threatened to cut out her eyes with a broken glass if she didn’t get out of the house. She did leave — to return her brother to his parents — and that appears to have been the last time that Jane Elizabeth was allowed into the home. William Richard had had enough of her, locked all the doors against her, refused all attempts at reconciliation and would no longer provide any income for her. She was left with no option but to live with her parents. Rawdin was therefore suing his son-in-law for the cost of maintenance of Jane Elizabeth since that October night … at 10s a week. However William Richard told a slightly different story. He would go to work at four in the morning and when he returned at ten his wife was often still in bed … no fire made in the house, no breakfast ready for him!! He granted her a weekly allowance of £1 for household expenses but she often spent it on extravagances like grapes and other such delicacies, rather than paying their necessary bills and debts. On the evening of the quarrel they had argued over the ale and it was Jane Elizabeth who had left the home and refused to return. Her mother and father had then visited to remove some belongings from the house and he was left to sell what remained, in order to clear the debts accrued by his wife. He had sent the crier around town and posted an announcement in the local press, to alert people of the situation, and was now reconciled to being on his own … in no way did he want his wife back !! The judge could see faults on both sides and reminded both that marriage was ‘for better or worse’. Weighing up the evidence he determined that the quarrels were the result of both losing their temper and neither had chosen to give way. However he judged that the wife was not in serious danger and so had no right to leave her husband. Her father was not therefore justified in taking her in and maintaining her, and so could not expect recompense. Rawdin left court having lost the case but gaining a hefty bill for costs. Nearly 15 years later — December 1898 — and Jane Elizabeth was in another Court … the Divorce Division of the High Court of Justice. By now she had accumulated the finance, sufficient to sue her husband for divorce on the grounds of desertion, cruelty and adultery. Her story was recounted once more but this time with a significant addendum. It was shown that earlier this year William Richard had set up house at 28 Graham Street in Ilkeston with a woman, not his wife, and two children. She was Annie Attwood and the parents of the children were Annie and William Richard. The latter chose not to defend the suit and Jane Elizabeth was thus granted a decree nisi. In 1900 William Richard Blake married Annie Attwood at Nottingham and continued to live in Ilkeston. Also in 1900 Jane Elizabeth Blake (nee Brown) married Rowland Smith Fearn at Basford Register Office and they too lived in Ilkeston. And ‘Rordon’ Brown died in Burr Lane in 1902, aged 72. Son ‘Chillas’, lacemaker, was the youngest son Achilles Rawdin, and was married to Maria Smith, youngest child of shoemaker James and Elizabeth (nee Rice) of Chapel Street in June 1859. James had met a violent end to his life in 1841. (See the Queen’s Head). Chillas and his family also very rarely strayed far from Burr Lane. He did spend a short time about 1861 at Bolsover, serving as a police constable but very soon returned to live in the Chapel Street area. 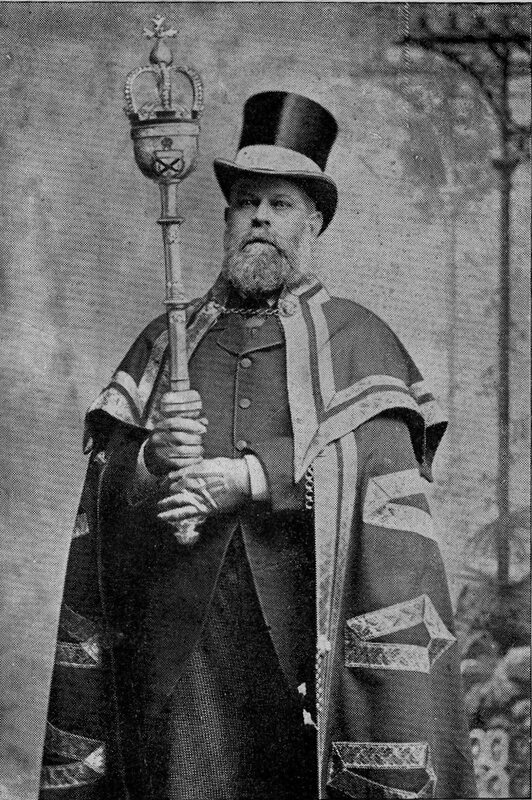 A picture of Achilles, resplendent in the garb of mace bearer to the Corporation, appeared in the Advertiser of 1905, marking his death on July 11th at 62 Burr Lane, aged 72. The newspaper noted that he was employed at George Maltby’s factory in Market Street and although in ill-health, had worked until a few weeks before his death. 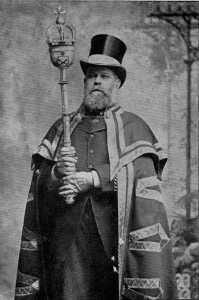 He was mace-bearer from 1887 until his death. Wife Maria also died in the Lane in April 1892. Hannah Rawdin was the youngest child, born in 1837. She had an illegitimate son, John Barker Brown born in 1855 before, in August 1857, she married lacemaker Emanuel ‘Man’ Barker of Awsworth Road, son of brewer and innkeeper at the Bridge Inn, John and Sarah (nee Smallwood). After the death of his father in 1888, ‘Man’ became proprietor of the Inn and died there in 1906. Hannah had also died there, in August 1899, aged 63. Hannah’s illegitimate son adopted the surname Barker and was married under that name on Christmas Day of 1879, giving his father as ‘Emmanuel Barker’. His bride was Lucy Canal Frost, eldest child of National schoolmaster William of the Market Place, and Lucy (nee Canal). It was approaching 11.30 pm on a late September night in 1891 and Achilles Rawdin Brown junior, only son of Achilles Rawdin Brown senior, was ready for bed, when he heard a knock at the door of their Burr Lane home. Upon answering it, he saw neighbour Ernall Brentnall standing there, somewhat agitated and seeking assistance. Ernall had just discovered a vagrant in his front yard, on his hands and knees, with a jacket over his head. He had tried to move the man but realised that he couldn’t do this on his own. And so, accompanied by Achilles, he managed to carry the man across the road on to some waste land. Achilles senior was then called by his son and his expert medical assessment that the man was close to death alarmed Ernall, who sped off to fetch the police. P.C. William James Lipscomb arrived shortly after midnight, noted the extreme plight of the vagrant, loaded him onto a handcart and took him to the Town Hall lock-up in the Market Place. Soon after this, Dr. Wood attended the man but found him ‘quite dead’, his demise caused by ‘destitution, exposure and general neglect’. He had 1s 2d on him, some bread and cheese wrapped in paper, and a bit of an old comb; he was clothed in ragged trousers, two waistcoats but no shirt, but was completely covered … in vermin !! By the time of the inquest the next day, the identity of the deceased had been established. He was 48-year-old John Thomas Glossop, an unmarried painter, born, and living all his life, in Ilkeston. His deceased father John had for many years traded as a currier in the town, at one time using a shop close to Mount Street. His youngest sister, Elizabeth Ann, had married Cotmanhay coalminer Ezekiel Sisson in 1874 and in recent times had lost touch with her brother … even though both never moved out of the town. A few days earlier an old acquaintance, widow Sarah Ann Shaw (nee Calladine) of Station Road, had written a letter for John Thomas, addressed to another sister, Ellen Maria Clarke, at Matlock, pleading with her to come to Ilkeston to rescue him from his destitution and debts. The widow paid for his penny stamp, gave him 8d and some tea … but he was too filthy to let into her house !! And if the letter reached Ellen Maria it was unfortunately too late to save her brother. This finished the houses on the East Side of Burr Lane, there were no more buildings until you came to Albion Place. …..